This week saw Kim Jong-un make his first visit to China as leader of North Korea. The trip, though apparently made at the Chinese leader’s behest, highlights once again how the North Korean government is heading down the diplomatic track in 2018, at the end of almost two years of exclusive focus on military objectives. News of summits between the Koreas, as well as the United States and the DPRK, sparked a period of intense attention from a wide variety of political and ideological positions. A number of opinion pieces have attached significance to the lack of coverage the issue has received in North Korea’s domestic media. However, a review of DPRK domestic media in the lead-up to the first two inter-Korean summits indicates that pre-summit silence is the norm, rather than material for frenzied guesswork. Negotiating strategy, venue, and denuclearization are all reasonable subjects for debate; conversely, the silence from Pyongyang ought not to be used as a platform on which to build an argument. Although the North tends to be less than forthright in the lead-up to summits, an examination of domestic media in that period still has value. The actors and conditions might have changed since the first summit nearly two decades ago, but North Korean media policy and historical narrative building remains much more consistent up to the present day. In order to analyze the discourse surrounding the inter-Korean summits of the last decade, access to archived press from Pyongyang was required. This was done at the National Library in Seoul, which is home to the North Korea information Center. The center not only holds an extensive collection of DPRK artifacts and books but also provides access to a digital archive of publications stretching back to the 1940s. Although the digital archives are vast, there are limitations in functionality. Only titles of articles, excluding the bodies of text, are indexed and searchable. While closer reading of daily editions of the Rodong Sinmun in the periods from announcement to historic handshake (March 9 – June 13, 2000; August 8 – October 2, 2007) was possible, due to sheer volume research outside of that period was conducted by searching for terminology of interest only. The advantage of doing research on Pyongyang state media is its repetitiveness. While terminology varies greatly from that of the South, once significant phrases are discovered it is almost certain that they will be repeated when a certain editorial stance is taken. While context is always crucial, the nature of North Korean rhetoric lends itself to measuring its ebbs and flows in terms of the frequency and timing of specific phrases. The following analysis summarizes the research findings. A Single Reference | While the breaking news of a historic first head-of-state inter-Korean meeting dominated headlines in the South on March 9, 2000, the front page of the Workers’ Party bulletin Rodong Sinmun was devoted almost entirely to more mundane issues of agriculture. The only mention made of the outside world: a reference to Juche study in San Jose, Costa Rica. The back pages, usually dedicated to covering international news, also make no mention of any summit. It is an entirely unremarkable edition of the Pyongyang daily newspaper. There is no discernible change of attitude to the South, with routine criticism aimed at US imperialists, the South Korean conservative party, and annual US-ROK joint military exercises. In fact, the summit is not at all reported on until it actually takes place. The term “6.15 declaration” (officially “6·15 남북 공동선언”) is first in use about six months after the summit, on December 7, 2000. It is then used more and more frequently from 2001-2004 while tailing off later in the decade. Similarly “10.4 declaration” (officially “남북관계 발전과 평화번영을 위한 선언”) first comes into use several months after the 2nd summit, on January 5, 2008, and then is used relatively frequently. The only mention of a summit before it actually happens comes through indirect means on June 6, 2000, roughly a week prior, in an article comprised almost entirely of quotes from the pro-North Japanese-Korean community newspaper Choson Sinbo. No details such as dates, location or participants are included. Rather, the summit is referenced once as a footnote, listing “support the South-North summit” as one of the slogans chanted at a rally, a second time with a call for an end to American interference in a South-North summit mixed in with various other demands, including the withdrawal of US Forces Korea, the removal of the National Security Law, a total revision of SOFA (Status of Forces Agreement), and the establishment of a truth commission to investigate the murderous crimes of the US military and its bombings of Maehyeong-ri, as well as an apology and compensation to the victims. The use of “South-North summit” is the term used in Seoul and reflects the fact that the article is merely relaying external reports, as Pyongyang uses a different term to refer to the summits, putting North before South.1)Summit diplomacy makes its way into state-directed political culture too, namely documentary film. One such film is entitled “Great Leader Kim Jong-il and Kim Dae-jung United,” as it is reported in a Rodong Sinmun headline from September 18, 2000, on page four (officially기록영화 <위대한 령도자 김정일동지께서 김대중대통령과 상봉>을 관람). The article talks about the film being screened at a festival taking place at the Koryo Hotel (In full: “제7차 쁠럭불가담 및 기타 발전도상나라의 들의 평양영화축전 참가자들이 17일 평양고려호텔에서 우리 나라 기록영화 < 위대한 령도자 김정일동지께서 김대중대통령과 상봉>을 관람했다.”) The content strikes a positive tone, focusing on 70 million people’s wish for peace and unification. A similar article appears 15 years later on June 16, 2015, again about a showing of the documentary. This time the film is shown at the East Pyongyang Theater (동평양대극장). Various North Korean political figures and “overseas Koreans” (해외 교포) attended the screening, according to the report. Softening Rhetoric | While not making direct mention of the summit itself, it is not unreasonable to expect a softening of rhetoric before the meeting of supposed brothers. The months preceding the June 15 summit however, reveal no discernible let-up in harsh rhetoric until as late as the second week of June. In the period from the confirmation of the summit on March 9 up to June 8, South Korea is dismissively referred to as “the Southern puppet” a total of thirteen times. However, from June 9, 2000 a clear line is drawn in editorial policy at the newspaper: epithets are dropped. June 6, 2000 also sees the last use of the phrase “Peaceful unification,” which had appeared frequently until October 13, 1999. Its use resumed two months later on August 5. Clearly signalling a change in direction, June 9 features a page two story dedicated to the “revolutionary legend” of Kim Il-sung pining for a swift return to Seoul to see his brethren in the South. It is the story of a dream that Kim Il-sung had in 1966. It recounts the sadly all-too-brief moments he spent in the South during the war, in which he was not able to speak with those in the South. June 11 furthers the warm-up with a front page story of international support for Korean unification. June 12 features stories on unification on both pages two and five. June 14 reveals a clear agenda in glorifying the city of Pyongyang with large pictures of the city and the Juche tower, preparing the narrative for a “historic Pyongyang summit,” language which was about to become de rigueur. June 14 marks the day that out of nowhere, large photos and bold headlines of the meeting of Kim Jong-il and Kim Dae-jung dominate the first three pages of the newspaper. Coverage starts tailing off rather abruptly from June 17 onwards, with talk of the summit either absent or in the back pages in the following weeks. 2007-2008: Summits and Puppets | The second inter-Korean summit in 2007, follows a slightly different but similar path. While Pyongyang announces the summit in synch with the rest of the world on August 8, 2007, it then follows a very similar path to 2000 with a void of coverage until the day itself, on October 4. There is also a slight difference in the front page spread dedicated to the second summit, one non-summit related article is printed at the bottom of the page which reaffirms dedication to the Songun line. The following day’s front page is comprised entirely of an 8-point agreement between the leaders of the two Koreas. In general coverage of the 2007 summit is not quite as extensive as the first, and it should be noted that the summit comes towards the end of Roh Moo-hyun’s term, which would hail a shift in course from Seoul. Although the term “Southern puppet” is nowhere to be seen for the entirety of the Sunshine era, it comes back into vogue soon after the February 2008 election of Lee Myung-bak, rapidly returning to 1990s level of prominence. While a less common phrasing, “puppet army” also goes on hiatus for seven years from May 2000 to June 2008, before normal service is resumed with eleven usages in the latter half of 2008. The insult of “traitorous” follows a similar trajectory, only being used six times in the Sunshine era, always to refer to the South’s conservative party, but then makes a comeback, appearing in print 47 times in 2008, mostly to insult then-president Lee Myung-bak. 1. ↑ Summit diplomacy makes its way into state-directed political culture too, namely documentary film. 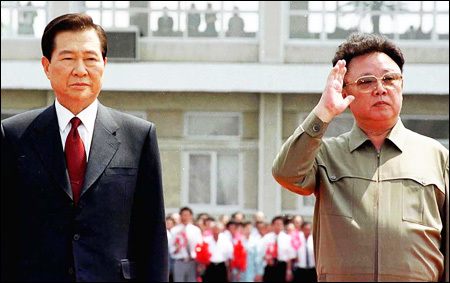 One such film is entitled “Great Leader Kim Jong-il and Kim Dae-jung United,” as it is reported in a Rodong Sinmun headline from September 18, 2000, on page four (officially기록영화 <위대한 령도자 김정일동지께서 김대중대통령과 상봉>을 관람). The article talks about the film being screened at a festival taking place at the Koryo Hotel (In full: “제7차 쁠럭불가담 및 기타 발전도상나라의 들의 평양영화축전 참가자들이 17일 평양고려호텔에서 우리 나라 기록영화 < 위대한 령도자 김정일동지께서 김대중대통령과 상봉>을 관람했다.”) The content strikes a positive tone, focusing on 70 million people’s wish for peace and unification. A similar article appears 15 years later on June 16, 2015, again about a showing of the documentary. This time the film is shown at the East Pyongyang Theater (동평양대극장). Various North Korean political figures and “overseas Koreans” (해외 교포) attended the screening, according to the report.